Did you know that Senator Leila de Lima almost became a Chief Justice? The Battles for Chief Justice over the past two decades are nothing short of Amazing. And yes, that’s with an “s”, and a capital “A”. IMPORTANT NOTE: ThinkingPinoy spoke recently with a Justice who’s extremely privy to the inner workings of the Supreme Court. He spoke on the condition of anonymity because save for the Supreme Court spokesperson, court officials traditionally do not speak in public, and the Supreme Court heavily respects tradition. Unless otherwise specified, all claims here are based on the Justice’s version of events. Let’s call him Justice Joseph de Mesa, or JD for short. For purposes of discussion, all pronouns will use “Joseph” as an antecedent but this should not in any way suggest the actual gender of this justice. You see, I fiercely protect my sources, especially JD because I will still need to talk to him in the near future and beyond, and I think he may need me to speak about things that he cannot say publicly himself. Note that I have spent all night writing this so I do not have the time to proofread it anymore. I have a morning radio show Karambola sa DWIZ 882 at 8-10AM so I need to get some sleep. I apologize for any typographical error. JD said Solicitor General Jose Calida will be filing a Quo Warranto petition directed against the validity of Chief Justice Lourdes Sereno’s appointment. A Quo Warranto is a writ or legal action requiring a person to show by what warrant an office or franchise is held, claimed, or exercised. Simply put, it requires the respondent – in this case Sereno – to justify why she’s an associate justice. If granted, Sereno’s appointment would be rendered void from the beginning, thereby effectively removing her from the Supreme Court. That is, the prospective Impeachment Trial that follows after the House of Representatives transmits the articles of impeachment to the Senate would be rendered moot and academic. JD said the grounds would most likely include, among others,  Sereno’s failure to provide her SALN from the 10 years immediately preceding her appointment, and  Sereno’s psychiatric report. Collateral attacks against impeachable officials, however, are supposedly forbidden under Philippine Law. Calida’s Quo Warranto petition is an example of such. But then, JD said the Supreme Court has the final say on what’s legal and what isn’t, and the SC can find a legal way to go about it. JD is right on that one. After all, the SC decision on Kabigting vs. Acting Director of Prisons [G.R. No. L-15548] states that “…the Supreme Court, being the court of last resort, is the final arbiter of all legal questions…”. But I think it would be fun if we can let JD give us a glimpse of the inner workings of this institution, culminating to the problem that is Maria Lourdes Sereno. JD said this “Sereno Saga” is the unintended culmination of the maneuverings of Justice Antonio Carpio and his law firm CVC Law, or more popularly known as “The Firm”. Avelino “Nonong” Cruz was the Presidential Legal Counsel until his 2004 appointment as Defense Secretary [DND]. Simeon Marcelo was Ombudsman [Omb]. Joe Nathan Tenefrancia headed the Presidential Management Staff [AsiaLaw]. Then CVC Law senior partner Antonio Carpio was made Supreme Court Associate Justice in 2001, making him the one of the youngest SC appointees in history [SC], while the remaining senior partners managed The Firm: Arthur “Pancho” Villaraza was its CEO and Raoul Angangco was in the executive board. But there’s a catch: JD said Carpio wasn’t supposed to be appointed to SC back then. He said it was supposed to be Renato Corona. In 2001, a slot in the Supreme Court was in the offing after the retirement of Justice Minerva Gonzaga-Reyes, who reached the mandatory retirement age of 70. All the lawyers close to Arroyo were gunning for the position. JD said Arroyo’s “Top Two Choices” were Renato Corona, her long-time Chief of Staff, and Antonio Carpio who was, at the time, working for “The Firm”, the same firm that prepared the plunder case against Estrada. The catch: there’s only one Associate Justice slot for 2001, with the next one coming in 2002. One of the two candidates had to give way. JD said the eventual consensus was that Corona would be Associate Justice, while Carpio will be Ombudsman. Carpio supposedly agreed, as the Ombudsman is far more powerful than an Associate Justice. Aniano Desierto, the sitting Ombudsman at the time, would complete his term in 2002 [Omb]. JD said on October 25, 2015, Arroyo gave Corona his appointment papers. The next morning, however, Corona was surprised to learn from a Palace aide that Carpio was about to take his oath as Associate Justice in a few hours. Afterwards, a military official approached Corona and said Arroyo requested the return of his appointment papers, and he did return them. JD said Corona asked the military official if he can at least photocopy the document first, and the official obliged. But why did this happen? JD said the appointment of CVC lawyers to key government posts was no coincidence: he said CVC wanted to someday have a Philippine President who comes from their ranks… and Carpio’s 2001 appointment was key. Nonong Cruz, as defense secretary, would be able to establish connections in the Armed Forces. Simeon Marcelo, as Ombudsman, can put a lid on any political opponent. Joe Tenefrancia, as PMS chief, serves as Arroyo’s de facto cordon sanitaire. He potentially can block the access of CVC rivals to Arroyo. Pancho Villaraza and Raoul Angangco manage the Firm to ensure continuously massive income stream, i.e. funding for a future presidential campaign. And JD said they plan to make Carpio a Philippine President, by turning him into a Chief Justice first. Carpio was only 52 years old at the time, and that’s very young by “industry standards”. A Chief Justice position would not only provide long-term power and influence, but it is a source of gravitas – a steppingstone – for a Presidential Aspirant. Moreover, should future conditions be insufficient to justify a presidential run, Carpio can choose to remain Chief Justice, and he will do so until he reaches 70. That means holding so much power for a long, long time. But due to certain circumstance that will be explained shortly, JD said Carpio cannot be made Chief Justice if he wasn’t appointed in 2001. And JD said that’s why Carpio had to betray his best friend Corona. The Supreme Court heavily respects tradition, and it was the tradition at the time for a President to choose a Chief Justice among the three or the five most senior associate justices, with seniority based on the length of time served as associate justice. JD said according to CVC’s calculations, 2001 was the optimal date for Carpio’s SC appointment, i.e. 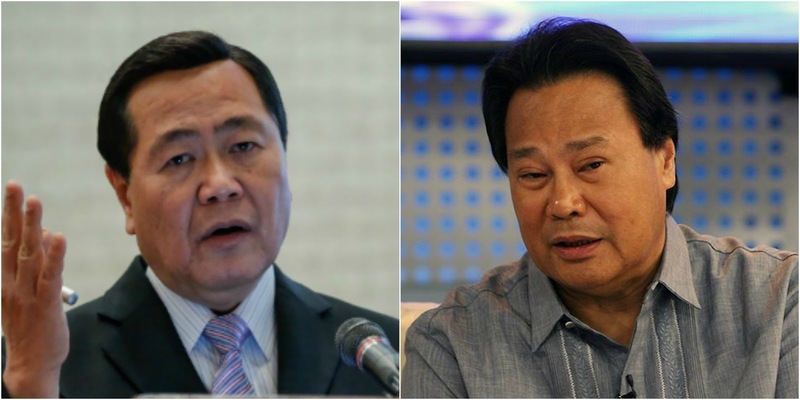 it gives Carpio the best odds of becoming a Chief Justice while Arroyo was still president. This made sense when JD told me that Carpio, along with CVC, supported the nomination of Associate Justice Artemio Panganiban for Chief Justice in 2005, right after Chief Justice Hilario Davide reached 70, the mandatory retirement age. Upon Davide’s retirement, JD said the top choices were Justices Reynato Puno and Artemio Panganiban. However, Puno was a lot younger than Panganiban as he will reach 70 on 17 May 2010, or less than two months before Arroyo finishes her term. JD said this is bad for CVC law, because that’d mean the ban on midnight appointments may be in effect, thereby preventing Arroyo from appointing a new chief justice to replace Puno. JD said Panganiban, who turns 70 in 2007, was the more optimal choice vis-à-vis CVC’s interests. By the time Panganiban retires, JD said Carpio would be among the top 5 most senior justices in the High Court, supposedly making him eligible for nomination as Chief Justice per tradition. Panganiban was eventually appointed Chief Justice in 2005, which raised hopes for CVC’s Carpio because he could be nominated for Chief Justice when Panganiban steps down in 2007. And this will not be possible if Corona was appointed in 2001. Carpio had to be “it”, and Corona was appointed to the Supreme Court in 2002, after another sitting justice retired. For Carpio in 2005, so far, so good. JD said everything was happening according to plan, until Carpio and CVC Law eventually made a terrible miscalculation. On 27 June 2005, President Gloria Macapagal-Arroyo went on TV to admit that it was her voice behind the leaked phone conversation that ignited the “Hello Garci” Scandal [GMA]. Arroyo’s hold on power immediately fell under grave threat as she was bombarded by national media and other influential civil society groups. Everybody – including a number of Arroyo’s own cabinet members – thought she would fall. 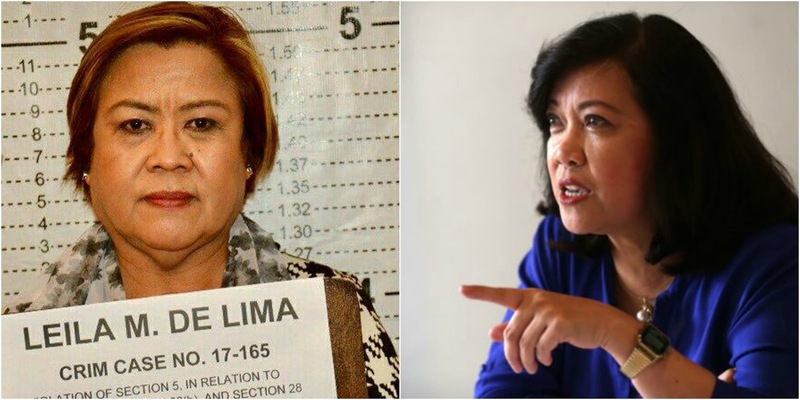 Corazon "Dinky" Soliman, Social Welfare Secretary notorious for allegedly pocketing Typhoon Yolanda (Haiyan) donations. Imelda "Meldy" Nicolas, Lead Convenor of the National Anti-Poverty Commission and sister of Loida Nicolas-Lewis and one of the key figures involved in the #LeniLeaks Scandal. Florencio “Butch” Abad, Secretary of the Department of Education and involved in the Dengvaxia Scandal. What many failed to notice, JD said, was that it was actually CVC law who planned and executed this failed overthrow of Arroyo. JD said it was CVC that flew to Hong Kong to meet then Vice-president Noli de Castro to ask him to succeed Arroyo upon the latter’s deposal. JD said CVC had to do this because the military, at the time, insisted that they would support a new government only through constitutional succession. JD said De Castro rejected the offer. De Castro eventually went to Arroyo and explained to her that her own lawyers are scheming against her. And that was when things went downhill for Carpio and CVC law, JD said. Suffice it to say, when Panganiban stepped down as Chief Justice two years later in 2007, Carpio was already out of the running and Reynato Puno, who was bypassed in 2005, became the new Chief Justice. Arroyo tightened her precarious grip on the presidency post-Hyatt 10 by pardoning the incarcerated Estrada [Reuters], in an attempt to quell the unrest among Estrada’s still-gigantic mass support base. Afterwards, Arroyo’s was largely safe for the rest of her term, i.e. CVC was forced out of the Halls of Power until Arroyo stepped down in 2010. With CVC Law’s fall from grace, JD said The Firm started to feel financial strains, eventually leading to CVC splitting in into two separate firms as a couple of senior partners left the group over managerial and financial differences [Inq]. To make matters worse for Carpio, Arroyo controversially appointed Renato Corona as Chief Justice barely over a month before her term ended. That is, the guy that Carpio supposedly betrayed for him to become Chief Justice, actually became the Chief Justice instead. But JD said Carpio wasn’t done just yet. Aquino’s first Supreme Court appointee was then University of the Philippines Law Professor Maria Lourdes Sereno. An academician with little to no litigation experience and zero experience as a trial judge, JD said Sereno badly needed a mentor and Carpio volunteered to be her sensei. JD said Sereno is not exactly the sharpest tool in the shed, and Carpio was quick to take advantage. He said Carpio made Sereno his personal attack dog to pave the way for then Chief Justice Renato Corona’s ouster. This made quite some sense when I saw that Carpio and Sereno tag-teamed Corona on the Supreme Court decision involving Arroyo’s foreign travel for medical reasons. I will not comment on whether Arroyo should have been allowed to travel or not, but what’s clear is that Sereno, despite being the most junior Associate Justice, had the gall to lecture Corona – with uncharacteristically strong words – in her dissenting opinion. Take a look at the 2011 GMA News report “Dissenting opinions shed light on Corona's role in pro-Arroyo TRO” to see how Carpio and Sereno apparently worked hand-in-hand against Corona. Corona even publicly accused Carpio and CVC law of masterminding his impeachment, an allegation that The Firm denied [Inq]. Regardless, we all know that Corona was impeached in 2012. What we don’t know, however, is that the Senate at the time supposedly told the Aquino Administration that it will impeach Corona on the condition that Aquino will not promote Carpio to Chief Justice. JD said many senators weren’t happy with the scheming Carpio, especially then Senator Jinggoy Estrada, who was put in jail thanks to the plunder case filed by Carpio’s Law Firm. JD said Aquino agreed and the Senate removed Corona from office, and the search for the new chief justice was on. JD said Aquino intended to fulfill his promise to the Senate not to appoint Carpio as Corona’s replacement. After all, Aquino still needed the Senate’s support for his legislative agenda, among others. He said Aquino’s number two choice was the Justice Secretary Leila de Lima, which appears to absolutely true as de Lima pleaded multiple times to the Judicial and Bar Council to give her a “fair chance” at getting the Chief Justice nomination [Inq]. But de Lima didn’t make the shortlist. JD said Carpio gave strict instructions to Associate Justice Diosdado Peralta, who was JBC presiding officer back then, to specifically EXCLUDE de Lima in the shortlist, saying that Carpio told Peralta that de Lima would become CJ if that happened. JD said JBC, as consolation to Aquino, complied with the latter's second request, which was to include Sereno in the shortlist. This explains why JBC included Sereno in the shortlist despite her failure to submit all the requirements. To be fair to Peralta, I would probably exclude de Lima from the shortlist with or without Carpio’s prodding, for the simple reason that a newcomer has never been made a Chief Justice ever, and the SC supposedly respects tradition. 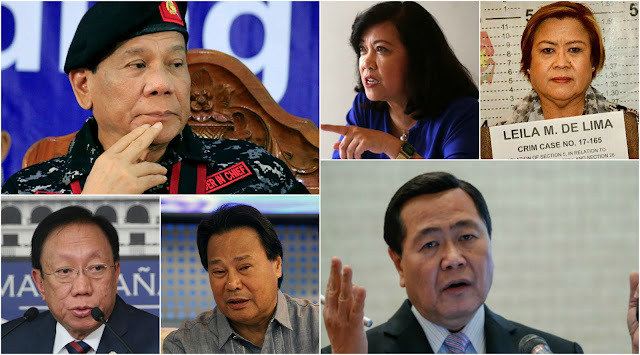 But JD said that from Carpio, who still had little idea about the deal Aquino made with the 2012 Senate, thought de Lima’s exclusion from the shortlist would enhance his chances at becoming Corona’s replacement. JD said Carpio then went on to tell then Associate Justice Lourdes Sereno to inhibit herself from the search for Chief Justice. JD said that to Carpio’s horror, Sereno declined. Sereno, like Carpio, WANTED to become chief justice. And that’s what happened. JD said despite Aquino’s misgivings regarding Sereno’s qualifications, Aquino still had to choose her because  She’s one extremely loyal attack dog with a long shelf life and  Aquino wasn’t familiar with all the other shortlisted candidates. And voila! 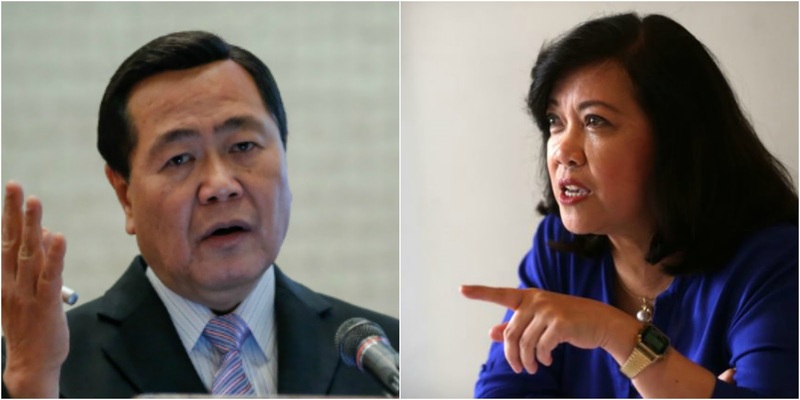 To Carpio’s unmistakable consternation, we got a Chief Justice Lourdes Sereno. Widely seen as Carpio’s attack dog that got Corona removed, Supreme Court employees greeted Sereno’s appointment with the utmost aloofness. JD said nobody wanted to work for her, and Sereno got people from outside, most of whom come from Sereno’s UP Law Portia Sorority Sisters. JD said Corona was widely loved by employees in the Supreme Court, and they hated Sereno for being one of the conspirators behind his removal. JD said Sereno and her staff didn’t know “how to be Chief Justice”, so Sereno committed, wittingly or unwittingly, error after error. This cemented her reputation in the High Court as one of the most incompetent chief justices ever. But Sereno’s problems go further beyond sheer incompetence, JD said. JD said Sereno brought her duplicity to the Office of the Chief Justice, as she deceived her High Court peers, in violation of the law. For example, Sereno announced the launch of a “Judiciary Decentralized Office” without consulting the Supreme Court En Banc. Along with the launch was the announcement that she would appoint her friend, Sandiganbayan Justice Geraldine Econg, to head the said office. The angered justices called Sereno for an En Banc meeting. Despite Sereno’s misdemeanor, the Justices still tried to be nice to her as they suggested to Sereno to gently take it down a notch. They asked Sereno to tell media that the JDO proposal was still being studied with Econg at the helm, providing Sereno and her friend a graceful way out. However, instead of doing so, Sereno told the press that the En Banc affirmed Econg’s appointment to the JDO, which is total opposite of what they agreed upon. This is just one of the many infractions that Sereno committed, and I leave it to the reader to check recent news articles that detail how she violated other laws and protocols. As expected, Sereno indeed became Aquino’s most loyal attack dog in the Supreme Court, especially after President Rodrigo Duterte entered Malacañang in mid-2016. At around 12:30 AM of Sunday, 07 August 2016, Duterte publicly released a “Narco List” that supposedly enumerates the names of current and former public officials who are involved in the illegal drug trade. Among these names were eight judges, and Duterte expressly instructed the said judges to report to the Supreme Court right away and explain their side. Note that the exact wording used may slightly vary because I only based the previous quote on the notes that I have written during the confidential interview. On Monday morning and instead of heeding Marquez’s suggestion, JD said Spokesperson Te sent a letter addressed to President Duterte and coursed through Justice Secretary Vitaliano Aguirre, asking Office of the President to provide details of the allegations against the judges. Aguirre’s Justice Department is in Padre Faura while Malacañang is in San Miguel Manila, and JD said Sereno didn’t want to wait. JD said Sereno was in a hurry to humiliate the president, so instead of waiting for Duterte to receive the letter from Aguirre, Sereno leaked the letter to traditional media on Monday afternoon. In short, Duterte found out about Sereno’s letter through the media, and not through official correspondence. Duterte felt extremely insulted, an he hates being humiliated. That's the kind of guy he is. And that’s where the Duterte-Sereno rift began, with Sereno drawing first blood. But this is not the only time Sereno openly antagonized the president. In January 2017, Sereno said that unsolved drug killings erode public trust in criminal justice system [GMA], a direct attack against Duterte’s War on Drugs. In March 2017, Sereno “held hostage” the papers of Duterte’s newly-appointed Associate Justice when she refused to release the appointment papers of outgoing Sandiganbayan justice and now incoming SC Associate Justice Samuel Martires. Justices even said that Sereno went on a power trip as she reportedly wanted Martires to “knock at her door” and personally get his appointment papers from her. [MT]. In May 2017, There’s the time issue where Sereno spoke against Martial Law in a forum in Ateneo de Manila, three days after Duterte declared it in Mindanao [ABS]. And by August 2017, it appears the Duterte’s allies’ collective patience wore thin, as the Volunteers against Crime and Corruption (VACC) and Atty. Larry Gadon attempted to impeach Sereno once and for all. The complaint appeared to have failed after failing to get an endorsement from any congressman [Inq]. But that’s when the other Supreme Court justices, upon hearing the complaint, stepped in. JD said several justices who had an axe to grind contacted the House Leadership to offer testimony and evidence. JD said the first one was Associate Justice Francis Jardeleza, who was initially reluctant to testify and offered Speaker Alvarez documents instead. However, JD said Jardeleza lost his reluctance when one of the latter’s friend warned Jardeleza that Sereno may survive the impeachment attempt if he doesn’t testify. Sereno manipulated the JBC shortlist to exclude Jardeleza: Jardeleza almost didn’t become an associate justice because of Sereno’s machinations [MT]. Jardeleza’s initiative encouraged the other Supreme Court justices to testify against Sereno, and that’s what happened. At first, I thought that the excruciatingly numerous House Hearings were intended to pressure the Senate into convicting Sereno in a prospective impeachment trial… but I was wrong. From the looks of it and based on the following revelations, it appears that the House Hearings’ target audience was the public at large. After several months of protracted impeachment hearings, the public has become aware of the multitude of violations that Sereno committed not only against the Supreme Court but against the Constitution itself. In short, should the Supreme Court En Banc decide to take matters in its own hands, it can use the proceedings of the numerous hearings as justification for their actions. Compare that to simply firing Sereno through an administrative case, something that will make Sereno look like she was being ganged upon. The House of Representatives is about to wrap up its impeachment hearings, and here’s where things start to rapidly accelerate. As mentioned at the beginning of this freakishly long article, JD said Solicitor General Jose Calida will be filing a Quo Warranto petition this morning, questioning the validity of Chief Justice Lourdes Sereno’s appointment. Again, the High Court general frowns upon collateral attacks against impeachable officials, as that would usurp the Congressional Powers to Impeach. However, JD said the SC will argue that an impeachment proceeding delves on acts that the Chief Justice committed after her appointment, while the Quo Warranto deals with those that were committed right before. Based on how I understood JD’s explanation, the Power to Impeach, which is the power to remove officials on the basis of acts committed AFTER they sat in office, will not be violated. This is because Sereno’s removal via a Quo Warranto petition uses a different “Power”, which is the power of the court to ensure that such appointment is valid to begin with. I think the nearest analogy would be Bongbong Marcos’ electoral protest. The Supreme Court, sitting as the Presidential Electoral Tribunal, can “remove” VP Leni Robredo from office by declaring her win void from the beginning because she cheated. Removing Leni, an impeachable official, would be constitutional in that sense. In the same way, the Supreme Court will say that Sereno “cheated” her way through by not submitting her SALNs prior to her appointment. JD said Sereno herself admitted this. After being asked by the SC En Banc to explain her failure to submit her SALNs, Sereno said 2001-2006 was so long ago so she can’t find them anymore so she sent JBC a letter explaining such, and the JBC subsequently exempted her from the SALN requirement. JD said the problem is that Sereno has so far failed to provide a copy of the said letter the SC En Banc, and JD said the other justices suspect that this may just be another one of her schemes to deceive her High Court peers. Regardless, JD said the High Court spoke with House Leadership and asked the latter if it’s possible to delay the transmission of the Articles of Impeachment to the Senate, to give them enough time to deal with Calida’s Quo Warranto petition without disrespecting the Senate. JD said the Senate Leadership said is fine with this arrangement, as the Senate is currently swamped with so much work, they want the House of Representatives to transmit the documents in May 2018. Given these, JD said SolGen Calida will file the Quo Warranto petition later today, 05 March 2018. Afterwards, Sereno will be given 15 days to submit a reply, and Calida another 15 days to counter. The entire exchange should end on the first or second week of April, giving the court ample time for oral arguments and enough time to pen a decision. JD said the Supreme Court is poised to grant Calida’s petition. They seriously want to kick Sereno out. In short, JD said we can all forget about a Senate Impeachment Trial: he said Sereno will be gone from Padre Faura even before it starts. With these said, I think that the biggest loser isn’t Sereno, but Carpio. After betraying his friend in 2001, it appears that Karma retaliated several times. First, when Arroyo made Puno CJ after he, the erstwhile CJ candidate, betrayed Arroyo. Second, when Arroyo made Corona CJ, the same Corona that he betrayed. Third, when Aquino appointed Sereno, who was just his attack dog. And today, should JD’s revelations turn out to be accurate, we will see an Antonio Carpio, the biggest critic of Duterte’s Foreign Policy, see what little hope he has left vaporize. Truth be told, I have no reason to doubt JD because he's been in the public eye for several years now and he's never been accused of lying. Even his friends, who I know personally, vouch for his honesty. Too bad he can't say all of these publicly because he's not the Supreme Court Spokesperson. Carpio appears to have started as a man with great potential. He then became the man who wanted to gain the world but lost his soul. And now, he’s a soulless man who stands to lose his last sliver of hope for redemption.